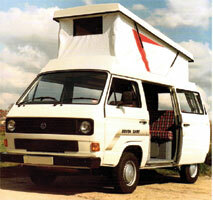 Circa 1984 Devon introduced a new “special” edition model called the T25 / T3 Volkswagen Devon Dart. 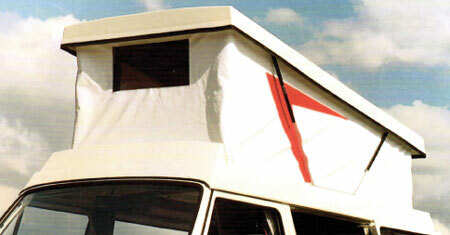 It had a new design of elevating roof called Devon “Aerospace” pop top roof. 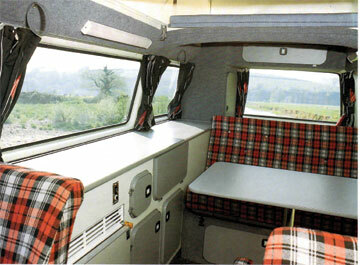 The interior layout was based on the Devon Moonraker with cupboards along the side behind the drivers seat and the rear seat converted into a 3/4 width double bed. 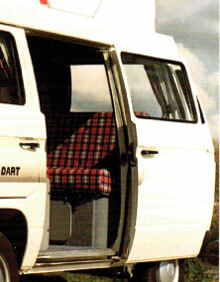 However the upholstery and furniture colours were updated with “designer” ultra modern designs. 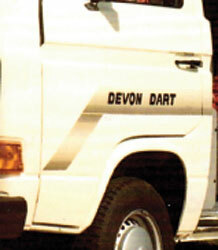 The Devon Dart was available with water cooled diesel and petrol engine options. Price below taken from Oct 1985 magazine buying guide price list. Do you have a copy of any other pricelist that you could send me ? Please help out and send me a copy or contact me for postal details. 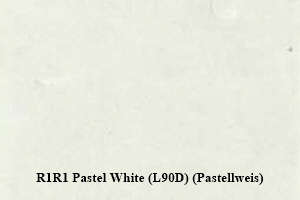 As far as I know the VW Devon Dart was available in 1 colour (although possibly other colours could be could be specified at extra cost). Side units and furniture were light grey with complimentary dark grey doors. Matching carpets and interior lining. Upholstery was 100% pure wool Darlington Tweed. 9) Fellows 2 burner cooker with heat shield and grill / Stainless steel sink and drainer with switch controlled electric pump and tap. 10) Electrolux RM122 two way (gas / 12 volt) refrigerator. Fridge has a built in ice cube tray. 11) Deep storage locker. Locker has a false floor to reveal gas bottle stored beneath. All the windows are fully curtained with black curtains with flower design. Insulated roof available at minimal extra cost. Distinctive flash on roof side.